Few months back, I had posted an easy Odd One Out puzzles. These puzzles were very much liked by the audience. So after looking at the visitors response to that puzzle, we created more Odd One Out puzzles in which we have used only one picture and different changes. 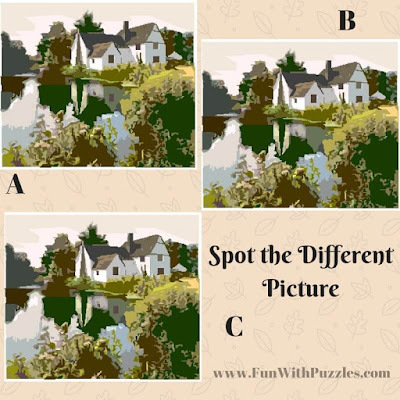 Again this puzzle also got a good response and then we created some Tricky Odd One Out puzzles in which one has to find the different picture out of given three pictures. 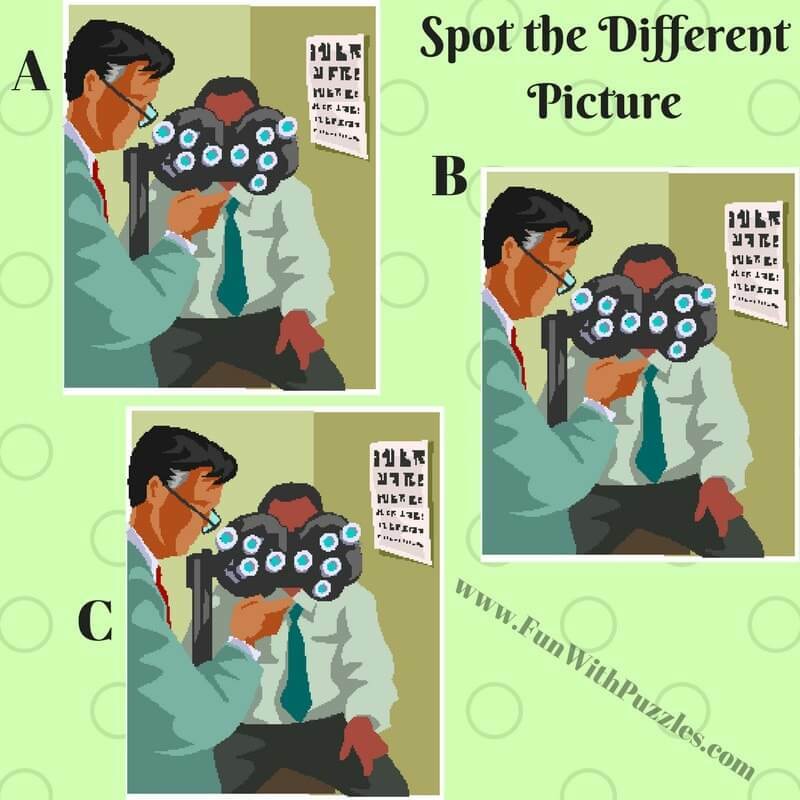 Now with today's post, we are extending this series to post few more puzzles in which one has to Spot the Different picture. 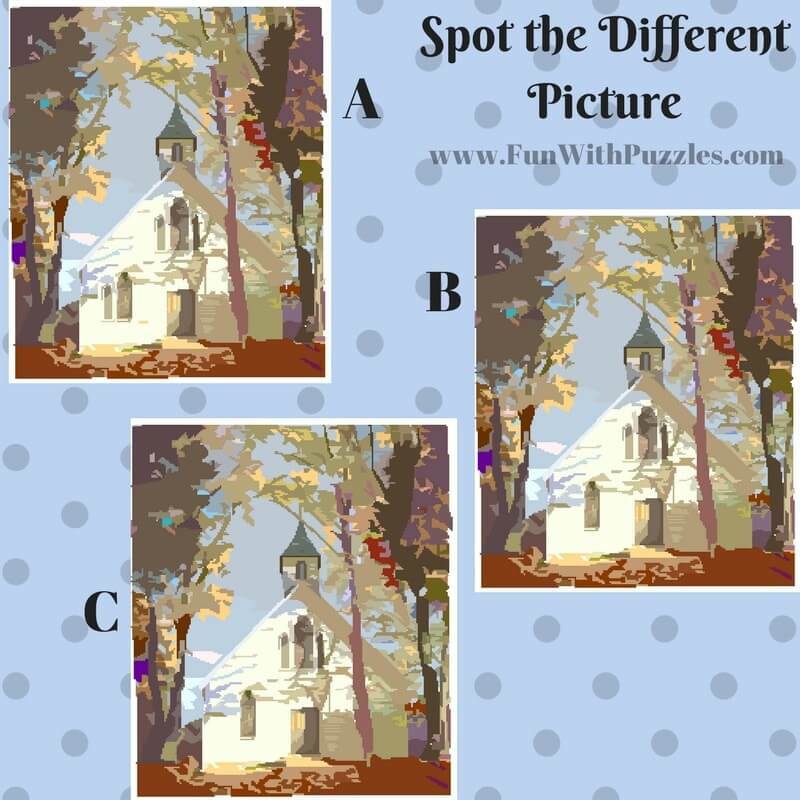 In these Spot the Different Picture puzzles, there will be three pictures given in each of the visual puzzle. Two pictures out of these three are exactly same. However there is one picture, which differs from these two pictures at least one of the point. Your challenge to find out this difference and thus point out that which picture is different from others two? Answers link to these puzzles is given at the end of this post. Do try to answer these puzzles without looking at the answers and check the answers, only to confirm that your answers are right. Do post your answers in the comment section of this post. 1. Can you find which picture is different? 2. 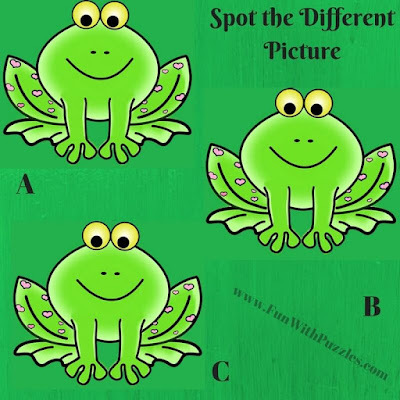 Can you find which frog is different? 3. Can you find which is Odd One Out? 4. Can you spot the different Picture? 5. Will you find the Odd One Out? 1. 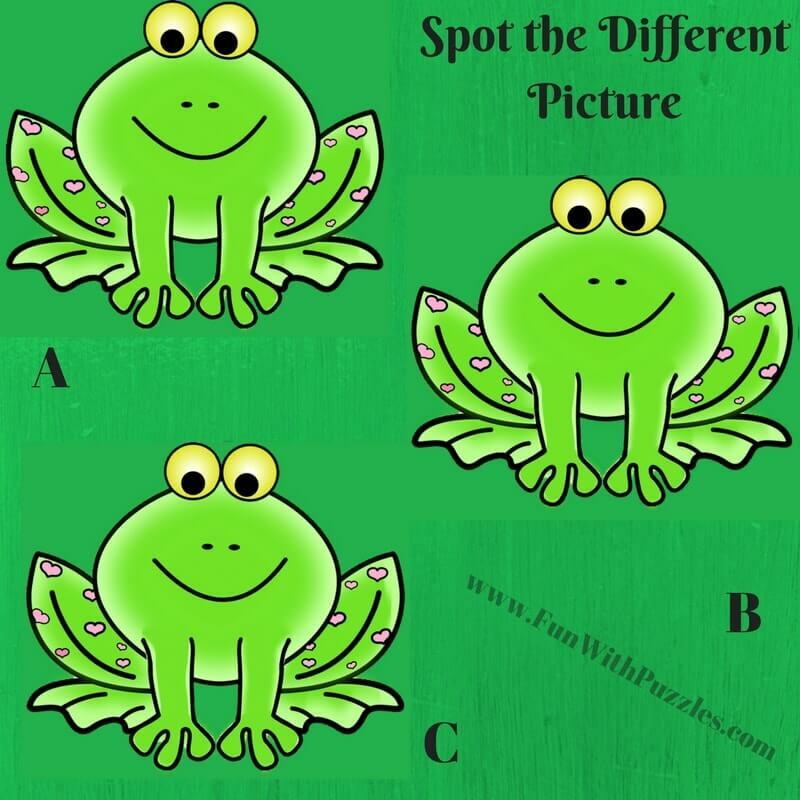 Odd One Out Picture Brain teasers for kids: These are Odd One Out Picture Puzzles in which four similar looking Puzzles Images are given and your challenge is to find which picture is different? 2. Observation Skill Test-Counting Number of Squares Puzzles: These puzzles will test your observational skills. 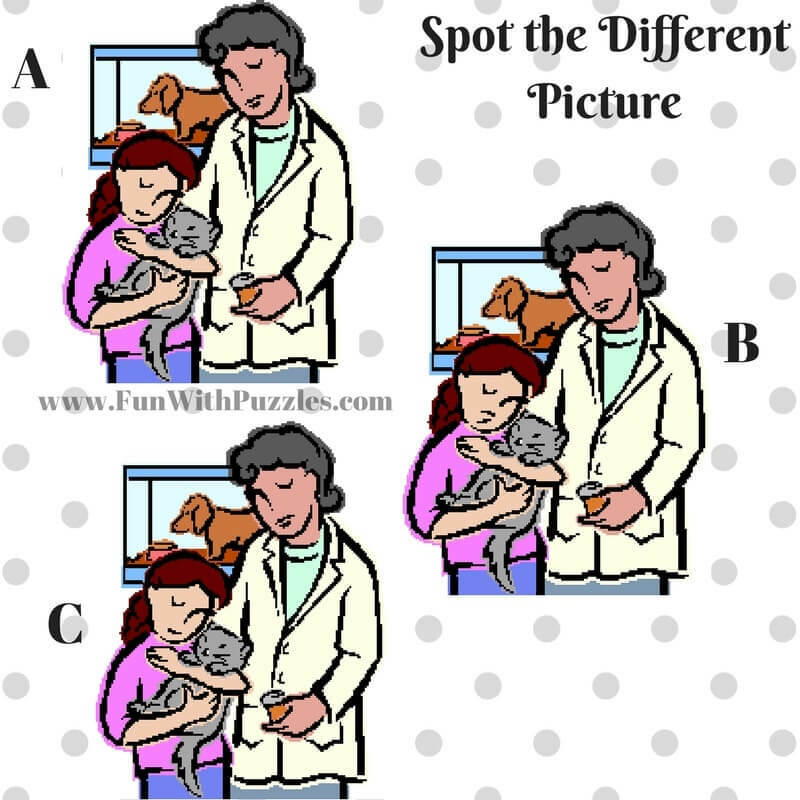 In these Picture Puzzles your challenge is count number squares in each of the Picture Puzzle Image. 3. Hidden Face in Picture Brain Teasers: Can you find the hidden faces hidden in the Picture? 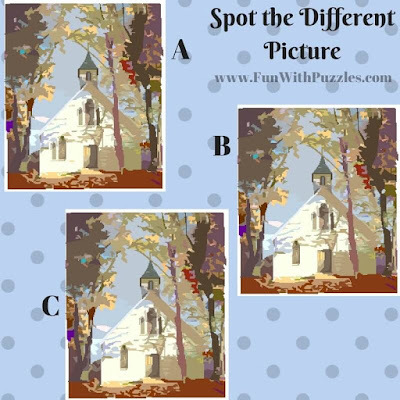 Just try out these puzzles and shake your brain to see these hidden faces!! 4. Out of Box Thinking Fun Brain Teasers: Can you think Out of box. 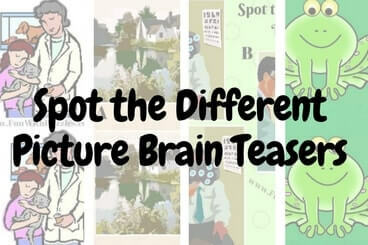 Here are many different fun brain teasers which will make your think out of box.